CORRECTION: Randall Reed said he was not a veteran or a recipient of several medals. He apologized for trying to embellish his past and asked that the story be corrected. Following the discovery of a San Luis Obispo man’s bicycle on Prado Road after a 4 p.m. curfew, homeless day center staff barred the man from having meals or taking showers at the center. While San Luis Obispo and homeless services claim they have modeled their programs to end homelessness after Santa Barbara, they are in fact very different, with San Luis Obispo having a long list of rules required to be followed in order to receive services. As of June 1, San Luis Obispo homeless services started enforcing a variety of additional rules for the homeless to follow including not riding their bikes legally on roadways within an eighth of a mile of the center. It is an issue attorney Stew Jenkins says violates their constitutional rights. To deprive someone of public benefits when they are doing something perfectly legal is a violation of due process and cruel and unusual punishment, Jenkins said. SLO City Council members and homeless services officials are backing a variety of strict regulations homeless are required to abide by. Requirements include not riding a bike or walking on Prado Road between 4 p.m. and 8 a.m., and signing away rights against searches of their persons and vehicles upon demand. If caught violating one of the center’s off site rules, homeless people are then denied services such as showers, lunches and laundry facilities for varying amounts of time that can lead to permanent ineligibility. Homeless for the past three years, Randal Reed was recently banned for a week from the Prado Day Center after his bike was spotted on Prado Road in the early evening. Raised in Cayucos, Reed worked in the construction industry, married, bought a home and adopted a child from Russia. His life began to spiral downward when the company Reed had worked with for more than a decade folded about four years ago, and he was unable to get another job. For the past three years, he has lived in a tent next to a river in San Luis Obispo. 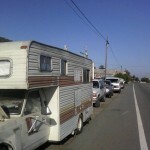 After he was diagnosed with cancer, he stayed in an RV on Prado Road for a short time with a friend. He moved back to the river when Prado Day Center officials said they would not allow those who sleep in vehicles on Prado Road to receive services. Last week, a business owner offered Reed a job welding at a Pismo Beach hotel. He started his job on Monday, but his bike was spotted on Prado Road last week after the center’s curfew, while he was getting ready for his first day of work and taking a bath in the creek. Councilman Andrew Carter said that because the rule against being on Prado Road is not new, it should be followed to discourage homeless from bothering business owners. In April, attorneys Saro Rizzo and Stew Jenkins filed a lawsuit against the city of San Luis Obispo and the chief of police for discrimination, harassment and the criminalization of homeless people. The attorneys are asking the court to order the city to stop enforcing a city ordinance that prohibits sleeping in vehicles and to pay financial damages and costs on behalf of their homeless clients. In addition, the attorneys contend the rules currently being enforced could eventually lead to further lawsuits against homeless services and the city. “An unconstitutional condition occurs when the government requires waiver of a constitutional right as a condition of receiving state benefits,” Jenkins said. OK, so he lied about Military honors, should be a crime, but, at least he’s getting a job. But then again, with a lot of you people, even if a homeless person tries to get a job, then you make fun of them if they are “dressed to impress”. So it’s damned if they do and damned if they don’t. I hope some of you people experience the loss of a job to due the economy, an illness, or an accident. Then let’s see how you get by. Let’s see how smart you are then! Getting a job? . His bad luck is all due to his BAD choices in life. Not from any accident, the economy or illness. The transient issue in this town is out of control. Anyone who doesn’t believe that most of these people are intoxicated, convicted felons and child molesters are in lala land. Until you take one of these “poor, down and out human beings who just need a hand up” in to your own home or let them park in your driveway, SHUT YOUR TRAP. I could care less if Mr. Reed says he was in the military, bottom line is he can’t follow the rules like the rest of society which is why he is in the situation he is in the first place. Please, all he needs to do is stop riding his stolen bike before 4:00pm so he can take a shower and get a free meal before he goes back out the next day to beg for money for liquor? Unbelievable. slojo, here’s a news flash for you: Slo Cops & Sheriffs are doing such a great job of running the homeless/transients/derelicts out of San Luis Obispo that they’re scurrying like cockroaches to other parts of the County where they won’t be “hassled” as much. Hell, we’ve got a raft of derelicts in Morro Bay & Los Osos that scurried out of SLO. I guess Law Enforcement is unwilling or unable to help the rest of the Communities, so now the crime rate will climb in other areas because the Sheriff’s will do NOTHING about illegally parked camper trailers, rv’s, etc. What are the rest of us to do? Take the law into our own hands or keep calling the Sheriff even though we KNOW it won’t do any good? A divided Supreme Court on Thursday overturned a federal law that made it a crime to lie about having earned a military decoration, saying that the law was an unconstitutional infringement on free speech. I’m sure it’s very hard to be homeless and it help’s one’s self esteem to have/claim an honorable past. Just being a good, honest, citizen who worked hard when work was available is good enough in my opinion. No need to be a war hero to be an honorable man. Me included, ” Give a guy enough rope he’ll hag himself”. LOL, The guy had his faults, but none that I would of doubt his word, ( stupid me!) I am glad he came forward,,,,,, maybe some good could come of this!~Like I am going to loose sleep over this, I’m calling my shink!!! !